The Israeli-Arab conflict is a long-standing ethnic, religious and national problem that has inflamed the Middle East for decades. Over the years, there have been numerous wars and campaigns of asymmetric warfare perpetrated by both sides of the conflict. Unfortunately, in addition to the violent conflicts between those involved, the conflict in the Middle East has been characterized by a slurry of propaganda and disinformation, largely aimed at smearing Israel on the international stage. This isn’t to say that Israel has abstained from the propaganda war, merely that they have a much smaller mouthpiece on the international stage (one Jewish state and the USA versus dozens of Muslim states, backed by unlimited oil money) and have not attempted to make as many outrageous claims as their opposition. In this article, I will make arguments against four of the largest and most toxic pieces of propaganda surrounding the Israeli-Arab conflict (if I wanted to debunk them all, this would have to be a book), and will then give my solution for progress towards peace. Put simply, this is not the case. While I will not argue that Israel has solved the problem of racism—they suffer from the same bigotries and racial conflicts that every country does—their society is nothing close to an apartheid nation. Most of the claims of Israeli apartheid come from a conflation of citizens’ rights and the rights afforded to refugees. It is true that non-citizen Palestinian refugees do not enjoy equal rights to Israeli citizens, but this simply a function of citizenship, not race. No country on earth gives legal parity between non-citizen refugees and citizens, and Israel is no exception to this rule. In fact, Palestinian refugees living in areas controlled by Jordan, Syria, Lebanon and Egypt have never received legal parity with the citizens of those countries and have often suffered far more draconian restrictions than those imposed by Israel—for example, Lebanon bans Palestinians from obtaining work cards, entering high-income professions (ex. becoming doctors or lawyers) or owning property. It is illegal for Israeli businesses or government entities to discriminate in matters of employment or service provision based upon race or religion. Arab and Palestinian Israelis have total legal equality in Israeli politics with Jewish Israelis—in fact, Israel is the country in the Middle East where Arab citizens are given the most power in the voting booth (not difficult considering that it is the only democracy in the region). Palestinian-Israelis serve in elected office and represent over 10% of their Parliament (if more Palestinian-Israelis were willing to recognize the legitimacy of the Israeli government and participate, their representation would further increase); additionally, Palestinian-Israelis have equal rights to become judges and have served on the Israeli Supreme Court. In 2000, the Israeli Supreme Court decided Kaadan v. Israel Lands Administration, where they confirmed explicitly that race is not an acceptable factor when determining the leasing or purchase of property. This proves two things: first, that Arab Israelis are not being legally isolated in segregated neighborhoods (as we saw in South African apartheid); and second, that Arab Israelis have access to the courts in order to fight against any legalized discrimination that may be written into law (also, not a characteristic of an apartheid state). Palestinians-Israelis have equal guarantees of legal and civil rights, as well as equal rights of religion and speech with Jewish and Christian Israelis. Israeli hospitals and civil security forces (ex. fire/police) protect and treat Arab and Palestinian Israelis with the same care as they do Jewish Israelis. No Israeli citizen is denied care at a medical institution because of their religion. The official languages of Israel are Hebrew and Arabic, ensuring that all citizens have access to legal documents that they understand. Functionally, speaking, the only legal difference between an Israeli Arab and an Israeli Jew is that Israeli Arabs are exempted from the military service mandate—that said, they may join the military if they choose to serve. When polled, Israeli-Arabs have demonstrated majority approval of Israel, when compared to other countries in the region. According to a study by the University of Haifa, 68% of Israeli-Arabs preferred living in Israel to living in any other country. When looking at an international perspective, Israel is one of the most equal countries. Non-Governmental organizations like Freedom House have regularly given Israel high scores in regard to its freedom index, despite the propaganda of those whom have an agenda. Accusations calling Israel an apartheid state are indicative of either ignorance, malevolence, or a desire to make a rhetorical point that flies in the face of the facts. It is particularly ridiculous when countries like Iran, Syria, or Saudi Arabia call Israel an apartheid state, considering their longstanding policies of oppressing non-Muslims and all women—if these states truly thought that apartheid were wrong, they might start by ending it in their own countries. Those who practice systemic racial and gender apartheid have no moral credibility for commenting on other nations’ policies and this is a case of manufactured indignation being used to serve a political narrative. Israel is a Jewish state, but it is also a state where everybody—whether they are a citizen, a guest, or a Palestinian refugee—is given the right to practice their religion freely. While it has an official religion, Israel is the only Middle Eastern nation which grants its population the right to believe and practice their religion of choice freely, as well as to switch faiths. This freedom of religion in Israel has led religious minorities of Christians and Muslim sects to seek sanctuary from religious persecution in Israel. 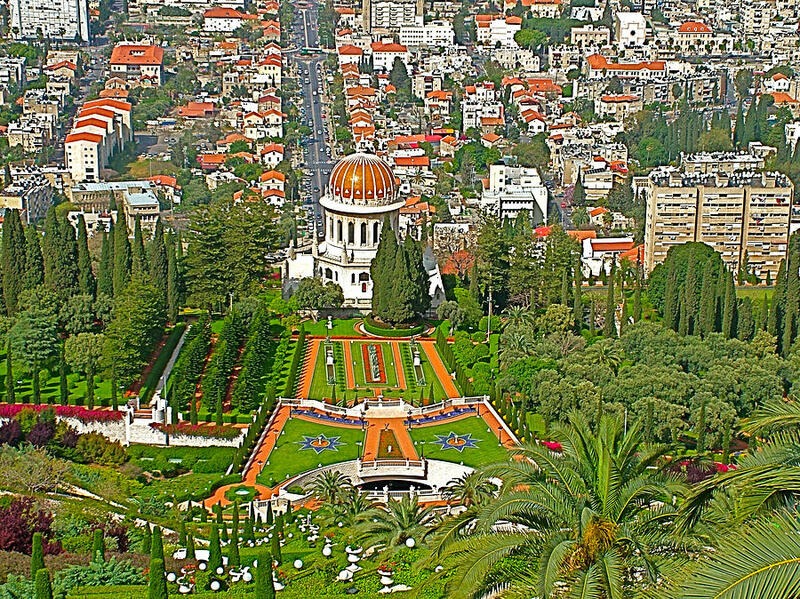 For example: the leadership of the Baha’i sect (an offshoot of Islam that the majority of Muslims see as blasphemous in the same way that some Christians see Mormonism as apocrypha) has sheltered for years in Israel because they would be killed in most Muslim countries. In addition to ensuring religious rights, Israel has shown itself to be willing to put secular freedoms above religious dogma in some ways that even the US doesn’t. While Israel won’t force religions to accept gay marriages, it recognizes all foreign gay marriages and allows civil unions of gay couples. The singling out of Israel in regard to its status as a Jewish state stinks of anti-Semitism and hypocrisy. Over 50 nations declare a state religion—most of which recognize a denomination of Christianity or Islam—yet, apparently, the only time this becomes a problem is when Israel decides to call itself Jewish. Anybody to protest Israel’s status as a Jewish state must either also protest all of the other countries which have a state religion equally, or must explain why Israel deserves such special treatment. This is simply nonsense that is not based in anything close to resembling reality. If Israel wanted to wipe out the Palestinians, its military is more than powerful enough to do so—that said, it understands that such a war crime would be morally reprehensible and indefensible, thus it would never even attempt to do so. Unfortunately, this morality has not been shared by the countries and extremist organizations which have fought Israel in the past. While they lack the power to actually destroy Israel militarily, terrorists have run a decades-long asymmetric war against Israel and Israel’s neighbors have, on numerous occasions in the past, embarked on wars aimed at destroying Israel and killing every Jewish resident of the region. Put simply, Israel possesses the power to commit genocide but lacks the desire to use it, while its enemies possess the desire to commit genocide but lack the power. While many will likely contest the assertion that Israel’s enemies would attempt genocide of the Israeli Jews, it is backed up by the historical facts. Israel wasn’t always a nuclear power with the backing of the United States and has faced repeated existential threats. For most of its life, Israel has been besieged on all sides by countries which wanted to kill them and harried from within by terrorists who committed suicide bombings and missile strikes on a daily basis (2,200 missiles were shot into Israel in 2012). 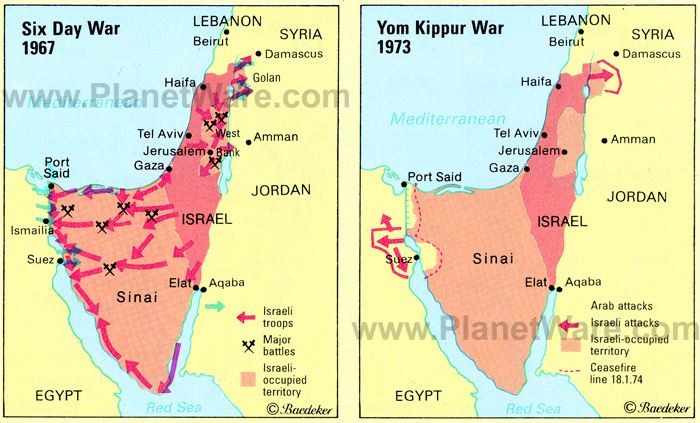 Arguably the two greatest examples of this aggression and unprincipled war come from the Arab-Israeli and Yom Kippur Wars. Within hours of its formation, Egypt, Syria, TransJordan and Iraq launched a coordinated strike against the newborn country in what would later be called the Arab-Israeli war.This was a surprise attack, motivated by religious hatred (if this were about the mandate itself, then TransJordan would have been attacked as well, because it was created at the same time) with the goal of genocide. Fortunately, the Israelis managed to repel the invaders. Unfortunately, for the Palestinians, those who left the country to wait out the genocide of the Israeli Jews were stuck between Arab neighbors who wanted to use them as a propaganda tool and the Israelis who saw them as traitors. On October 6th, 1973, Egypt and Syria, with the combat support of Iraq, Jordan, Cuba, Algeria, Morocco, and Tunisia, launched a surprise attack on Israel, with the intent of killing every Jew in the country. The thing which makes this attack particularly reprehensible is that it was carried out on Yom Kippur, the most important Jewish holiday, so that the invaders would have an advantage. While the surprise attack worked in catching Israel off-guard (they suffered approximately 2,500 casualties), the invasion failed, with Israel pushing the invaders back into their respective countries and inflicting as many as 18,500 casualties. Here is a thought experiment: If the Israeli leadership and the leaders of the Palestinian people were given buttons which, when pressed, could instantaneously kill every person of the other side (I.E. the Richard Matheson short Story “Button”), who do you think actually uses it? There is little doubt that the Palestinian leadership would jump at such a chance, while there is equally little doubt that the Israel leadership would not (after all, they actually have the functional equivalent to that button already, in real life). Given the history of the region, can anybody say that Israel is truly the genocidal county in the region with a straight face? They certainly have a tendency to overreact to aggression and can use excessive force, but this accusation is simply nonsensical. Israel has reacted with violence on many occasions, but this is a fact that must be looked at in context in order to prevent us from seeing a skewed picture. 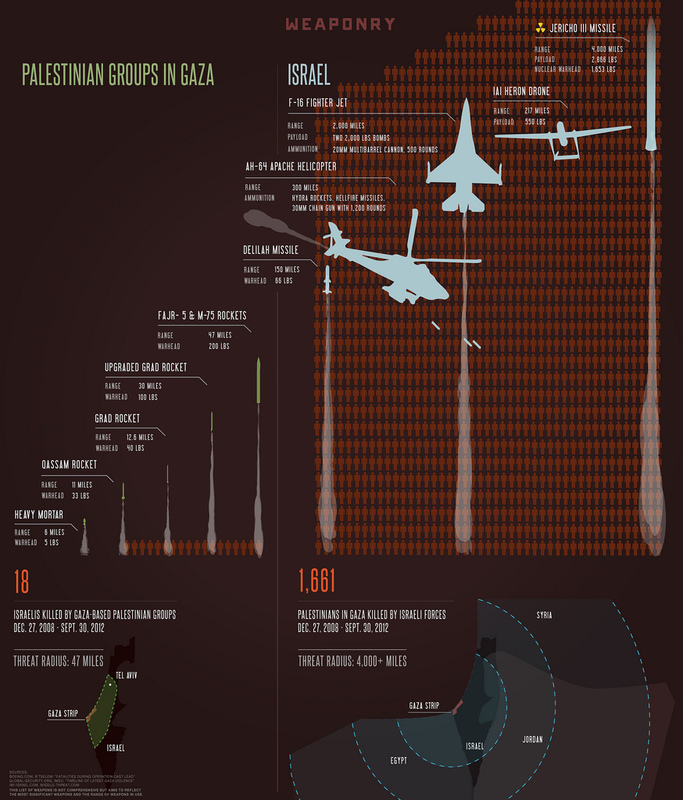 Over the years, thousands of Israelis and Palestinians have been killed in a long-standing asymmetrical war. During this conflict, mistakes have been made and both sides have done things that are morally wrong, but looking at this conflict as purely a function of Israeli excessive force is wrong. Israel does overreact to aggression and has killed civilians, but they have made attempts to minimize these deaths in compliance with the laws of war. Personally, I have major problems with the Israeli neo-conservatives and their warmongering/expansion of settlements, but there is no way to say that they have been any less responsible in their conduct than any other nation which faces persistent terrorism by a neighbor (if Mexican drug cartels started shooting thousands of missiles at Texas, how quickly and violently do you think the USA would react?). In 2012, over 2,200 missiles and mortar shells were shot into Israeli cities and towns by Palestinian terrorists–these attacks were done from behind the cover of civilians (ex. launching rockets from schools and Mosques), and with the tacit approval of many in the Palestinian leadership (Hamas or the Palestinian authority). The frequency of these attacks is in no way unique, and Israel has had to deal with similar numbers of strikes and bombings for decades. 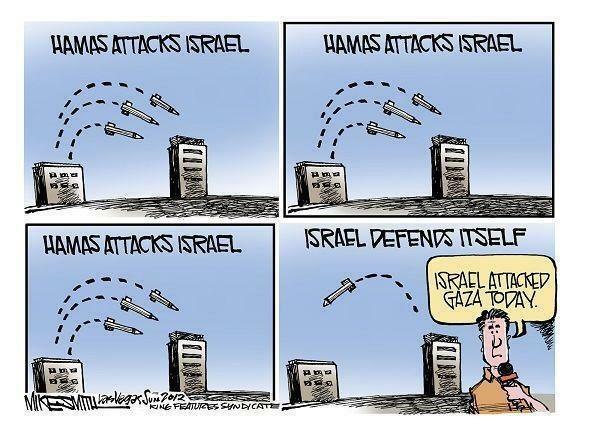 Despite the number of strikes into Israel, the media tends to only cover the conflict when Israel strikes back. This creates the misconception in the ill-informed that Israel is the aggressor in these exchanges. Unfortunately, in addition to this misconception, these responses are often bloody and have civilian casualties, as there is a pattern of Palestinian terrorist groups placing missile and mortar sites in mosques, schools, day-cares, apartment complexes and other areas where civilians are ever-present. The placement of these positions is intentional, and an effort to goad the Israeli military into killing civilians so that they can use the dead as martyrs in a propaganda war. The next time that you hear somebody call Israel evil and violent, imagine what it is like living in a country which is threatened by a dozen missile attacks every day, a history of being the target of genocidal wars, and a geographic location which is an absolute nightmare to defend. In the face of these threats, do you think that you would react any differently than Israel has? 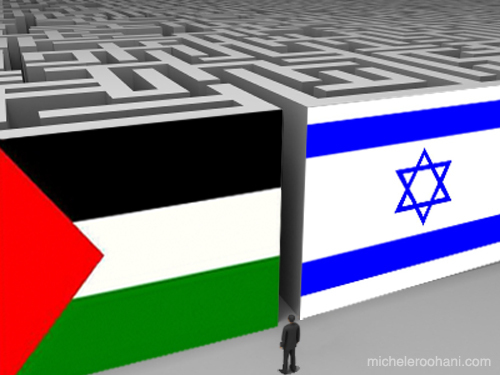 Put simply, we need a two-state solution where the Palestinians gain a geographically contiguous, antonymous state of their and Israel is left as a Jewish nation. If I were in control of Israeli policy, I would immediately begin withdrawal of all military personnel from the West Bank and Gaza, using the 1967 territorial borders as a guide—Israeli civilians would be allowed to stay in the ceded territories (there isn’t a legal justification to force them to move), but this would be ill-advised and I would implement a resettlement program (akin to the US’s imminent domain law) that would compensate civilians for the costs of moving. Jerusalem would be controlled by Israel, but Palestinians would be granted easy access to all of their holy sites. After implementing this withdrawal, I would completely sever Israel’s control over the contested lands, in effect, giving the Palestinians complete autonomy to create their own state. In addition to gaining control over the land, the Palestinians would be free to inhabit the now-abandoned properties of the Israeli settlers who chose to leave. This withdrawal from Gaza would allow a two-state solution to partially materialize (it would only be complete when the Palestinians gained fully state-hood in the international community) and would act as a release valve for the conflict. The Palestinians would gain the ability to create their own government, levy their own taxes, write their own laws, and build their own economy without any oversight or interference by Israel. From a military perspective, this option has a negligible effect on national security. The Israeli military is immensely powerful and could devastate the militaries of every surrounding country—this is without even considering the facts that the USA backs up Israel, that Israel has the Iron Dome defensive system, and that Israel has dozens of advanced nuclear weapons (likely over 70). The sheer power of the Israeli military virtually precludes the threat of a conventional invasion, but it still leaves the country open to a prolonged asymmetric campaign of terror. If the Palestinians are given their own state, complicity in these attacks or refusal to hunt those responsible would be an act of war (imagine if Canada started lobbing missiles over the border into Chicago). This would give Israel the ability to address their neighbors’ aggression in the international community and would force the new Palestinian state to either deal with its extremists in-house or face external sanctions. Unfortunately, this is an unlikely course of action by Israel and I predict that the current peace process will gradually devolve into a finger-pointing game where both sides blame the other for the failure. Also, TransJordan was created in 1922, 26 years before the establishment of the State of Israel and Israel’s Independence War and not “at the same time”. Perhaps the writer is unaware of it, but Israel is not levying taxes on 95% of the Arab population of Judea and Samaria nor does it provide them with services – it is the job of the PA and has been so for decades, since the ill-famed Oslo Agreements. Finally, Israel has completely withdrawn its citizens and armed forces from Gaza almost a decade ago, in 2005, forcefully evicting its citizens. The severely negative effects it had on Israel and the population of Gaza are well-known – thousands of missiles directed on Israeli civilians and a totalitarian abusive regime in Gaza. How brining the national airport of Israel within range of small-arms fire is “a negligible effect on national security” I leave to the writer to explain. We agree on the nuclear question, but you are otherwise incorrect. While the British territory of the TransJordan Emerites existed as a British territory (as Palestine did) from 1921 to 1926, they didn’t have autonomy from the British empire until the British Mandate which also gave the Israelis and Palestinians autonomy (what would have become Palestine was lost to Jordan, Syria and Lebanon in the Arab-Israeli war, thus it never materialized). Israel does collect taxes from the Palestinian territories, but it transfers these funds back to the respective governments (actually, one of the sticking points in negotiations is the fact that Israel has withheld tax revenue from Hamas in retaliation for their UN petition for statehood). Israel still controls the borders of Gaza and the status of the West Bank remains a rallying point for those terrorists who fire missiles into Israel from both Gaza and the West Bank. If Israel give the Palestinians in these regions full autonomy and supports their statehood, then those missiles become an act of war between nations and there would be no excuse for the UN not to impose sanctions on the new Palestinian state. As the Palestinians are heavily reliant upon UN aid, this would force their government to crack down on terrorism aimed at Israel, lest they lose their lifeline and get blamed for their people facing 75% unemployment and a complete lack of social services. If you think that the Palestinians present an existential threat to Israel, or even a significant military threat, you are simply ignorant. 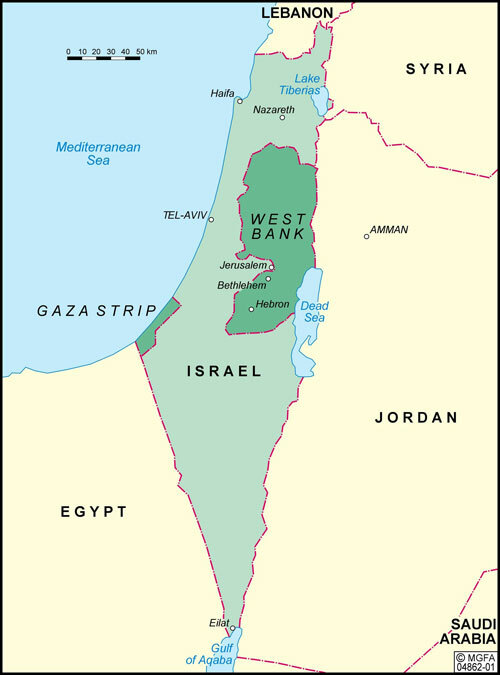 The days where Israel needed the West Bank to avoid being cut in half by an invasion from Jordan are long over (that was the original strategic reason for taking the Western portion of the West Bank), as Jordan is a tentative ally and Israel has weapons systems which can obliterate almost any conventional invading force. You said: “if this were about the mandate itself, then TransJordan would have been attacked as well, because it was created at the same time” – as TransJordan was separated in the early 20’s, and Jordan became fully independent in 1946, it was by no means “created at the same time”. Israel controls part of Gaza’s borders. Gaza also has a border with Egypt, so Israel AND Egypt control the borders of Gaza – and Israel has nothing to withdraw from Gaza, having already done so in 2005. Israel is collecting taxes on imports – not municipal taxes, nor is it providing those services – again, the PA does so (badly, but that’s not the point). Now to your proposal – I really don’t see the reasons for your optimism. Relying on the UN for any kind of action, especially against Arab states, is not really an option. I mean – what did the UN do in Syria? And how did the UN perform in Lebanon? Did it prevent any rocket attack on Israel? Disarm the Hezbollah? Not to mention Ukraine, Bosnia, or any other conflict where UN’s involvement seems to be worsening, not improving the situation. Since in your scenario Israel would keep control over Jerusalem, Israel would still be subject to manufactured outrage and real rocket attacks – Arabs have no intention of compromising on Jerusalem, otherwise they’d accept the proposals for a state on 98% of the “West Bank” and all of Gaza long ago. I think that the Gaza and Lebanon withdrawals have clearly shown that any territory vacated by Israel immediately becomes a base for attacks on Israeli territory, regardless of what the UN says. Those performing those attacks are insensitive to the suffering they bring on their own people, instead, they actively promote and increase that suffering, using it as a tool against Israel. I think that if Israel would act as you propose, the most likely scenario would be continous harassment of daily life in Israel, disruption of international flights and of communications to Jerusalem and on the coastal highways, places that are within reach of small-arms and mortar fire from the hills of Judea and Samaria. If that is not an existential threat, I don’t know what is. I had thought that Israel had already abandoned Gaza several years ago. They are still expanding settlements into the West bank and have control over the region–this includes territorial control over Gaza’s border. I haven’t read your post in its entirety but I agree, a two-state solution is a practical solution the conflict that allows Israel to maintain its integrity as a Jewish state. That being said, the claims of Apartheid are not without merit regarding Palestinians in the occupied territories rather than Israeli Arabs living in Jewish parts of the country with their rights protected. The genocide comparison is ridiculous, but I do believe the settlements are absolute colonialism and that Israel has practiced ethnic cleansing (which could be applied to the settlements, the forced removal of ethnic group to put in another one exclusively) as the US government has done to the Native Americans (ie trail of tears) and there have documented cases of institutional discrimination against Israeli Arabs, though they have more rights than in most other countries in the Middle East. 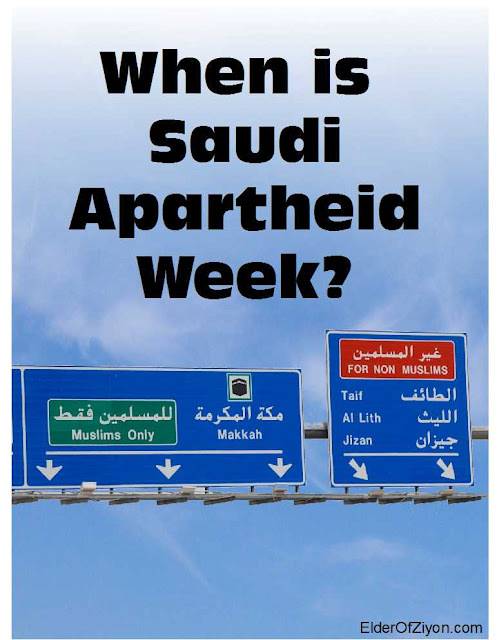 I do think the Apartheid analogy applies to the Bantustan like situation of the occupied territories, but not to Israeli Arabs living outside of them. Israel is more measured in its responses, but even you have acknowledged its heavy-handedness in retaliating to terror attacks. Aslo, the Jewish in the “Jewish state” refers to ethnicity not religion, Israel would arguably be a secular state as the Zionist movement of Herzl originally intended it to be, if not for the fact that familial law is under religious jurisdiction for different ethno-religious groups. A Jew by blood regardless of faith can automatically immigrate or visit if they can prove Jewish descent through ancestry. This does raise the issue of a double standard, if Jews can have their own ethno-state what about white gentiles, do the white nationalists have a point by this logic? I suppose the counter-argument is that Zionism like black nationalism was ethno-nationalism partially motivated by years of oppression, but there the some left-wing Jews who go so far as to deny Israel’s right to be a Jewish state and call for a bi-national one-state solution, which would doom Jewish votes in an election and demographically, which brings to mind white South African objections to integration. Which I am not defending but it does beg the question as to what the difference is morally. Are you not aware that Israel completely withdrew from Gaza 10 years ago?? Actually, while Israeli troops withdrew from the Gaza territory, they retain control over its borders and airspace. Thank you for a thoughtful and well researched post! I like your solution too; it’s hard to see how a rational person could oppose it. India and Sri Lanka are “Muslim Nations” according to your map??? Not this really makes me question the legitimacy of everything else that you say. Sorry! I thought your information would be based on the reality of the conflict, but you have absolutely NO IDEA! And it’s clear you are biased. Your post is just your own opinion and it’s not based on facts or any real or substantial knowledge.